Visit Rodanthe and nearby Outer Banks spots where you can experience firsthand the adventure and romance of the movie. The producers of Nights in Rodanthe, the big-screen adaptation of the Nicholas Sparks novel, couldn’t resist the unique flavor of the place the story was based. Much of the movie was filmed on the Outer Banks. Experience the adventure and romance firsthand on this 2-day trip. Start your movie trail in the town of Manteo, where some scenes were filmed at the boat slips downtown. Both Richard Gere and Diane Lane were spotted here often during filming, as both stayed at the Tranquil House Inn on Manteo’s waterfront. Treat yourself like a movie star by dining at the Inn’s restaurant, 1587, or explore the town’s rich history and boutique shopping. From Manteo, cross the U.S. 64 bridge and head south on N.C. Highway 12. 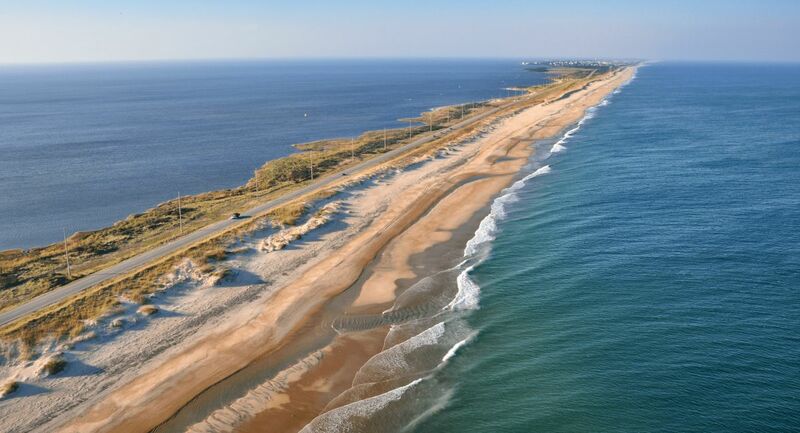 You'll immediately enter Cape Hatteras National Seashore and be drawn in by the windswept coastal scenery. Consider a stop at the 156-foot Bodie Island Lighthouse on your way. It’s open for public tours the third Friday in April through Columbus Day. About 15 miles farther, just before you get to Rodanthe, you’ll start to encounter a set of twists in the road. In the movie, on the ocean side of Highway 12, a scene was filmed with Diane Lane and a herd of wild horses. While the Corolla wild horses do roam free on the Outer Banks, the ones in the movie were imported. However, this particular stretch of beach is very real and very popular, thanks to its dynamic shore and natural beauty. Continue south for a few miles, and shortly after entering Rodanthe, turn left on Beacon Road to see the home where Lane and Gere’s characters met. Called the Inn at Rodanthe, the property has always been a vacation rental home. It was moved away from the edge of the surf and no longer has the dramatic (and dangerous) proximity to the ocean, but it still affords a romantic view of the sea. Decked out in its star-turn trim, the 6-bedroom house is available for rent (reservations might be competitive), but even if you stay elsewhere, you’ll want to snap a picture. An interesting story about the filming here: Although a nor’easter played a major role in Nights in Rodanthe, filmmakers were not happy when a real-life storm, which eventually became Subtropical Storm Andrea, blew in while filming was about to get underway and did minor damage to the Inn. The crew almost gave up and went somewhere else, but decided to wait it out. Ironically, though, the fierce rain that pounded the Inn in the movie came from a fire hose. Continue south on Highway 12 to two more film stops in Rodanthe. The first, JoBob’s Trading Post, is where exteriors of residents buying storm supplies were filmed. Diane Lane also was filmed here, and while the store is now closed, its exterior remains as it was in the movie. The second stop, Rodanthe Pier, was the scene of the party the villagers threw themselves after the storm passed. The scene was shot with about 400 extras and most of the principal cast. The wind speed on the night of the filming was between 25 and 30 miles per hour, and filming lasted until 4 a.m. It was a night that won’t soon be forgotten by locals. Farther down Highway 12, enjoy a dinner at Captain’s Table or Diamond Shoals restaurants located in the heart of Buxton Village, and as you decide where to stay for the night, check around with locals to see if the band Coyote is playing music anywhere nearby. They appeared in Nights in Rodanthe and regularly perform on Hatteras and Ocracoke islands. Begin your second day on the movie trail by driving onboard the free Hatteras to Ocracoke ferry, which departs every 30 minutes from May through October. Scenes with Richard Gere were filmed on this route, as Gere’s character Paul Flanner arrived on the island after driving in from Raleigh. After the 45-minute ferry ride, enjoy your 16-mile drive on Ocracoke Island. A few scenes from the movie also were shot in Ocracoke Village, so take some time here and enjoy sights such as the Ocracoke Lighthouse, the Banker pony pens, and Teach’s Hole Blackbeard Exhibit and Pirate Specialty Shop. Then, it’s time to board another ferry, this time a 2.5-hour ride across Pamlico Sound to Cedar Island. Enjoy the views of Hatteras Village, the pristine beaches at the end of the island, and the wildlife on the sound. After you exit the ferry at Cedar Island, you’ll drive through Beaufort, Morehead City and Jacksonville on your way to Wilmington. Wilmington and its island beaches have been home to more than 400 film-related productions since the area was first “discovered” in 1983. Several interior scenes for Nights in Rodanthe were shot here at EUE / Screen Gems Studios, the second-largest movie studio outside of California. 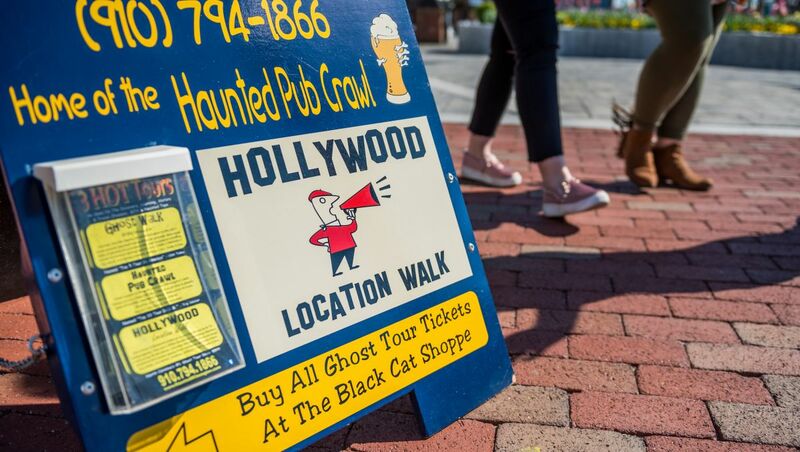 Though the studio isn't open for tours, you can get an insider's look at sites featured in Nights in Rodanthe, One Tree Hill, Iron Man 3 and other locally filmed projects on a guided Hollywood Location Walk.